The BBC has broadcast a live event in 4K resolution and high dynamic range (HDR) colour for the first time. Its iPlayer service streamed a full rugby match on Sunday, which was made available to the public but not promoted in advance. BT began screening live sport in 4K in 2015, and Sky followed a year later. But many experts believe HDR offers the more significant improvement of the two video technologies for owners of all but the largest TVs. "The trial met its objectives," said Phil Layton, BBC Research & Development's head of broadcast and connected systems. "We have proved our workflows, but like all trials there are issues we need to investigate and correct for the future." HDR takes advantage of the fact modern screens can go brighter and/or darker than they used to be able to, providing a greater dynamic range. As a result, the shadows of an image can be made less murky while the highlights - including glints of light reflected off metal or water - can be given more impact. This makes it possible to deliver a television image that gets closer to the dynamic range the human eye can handle, thus making the picture seem more realistic. HDR is also accompanied by the adoption of a "wider colour space", meaning millions more colours can be displayed on compatible screens than had been the case before. "We were very pleased when the Sun was able to push through the clouds, allowing the HDR to really show its full potential and capabilities in both dynamic range and the Rec 2020 colour space," said Quinn Cowper, from Timeline Television, which was also involved in the BBC trial. By contrast, 4K - also known as ultra-high definition (UHD) - refers to the fact that an image contains four times as many pixels as a 1080p high definition picture. This allows more detail to be displayed, but unless the TV is large or its audience is sitting close by, it can be hard to tell the difference. "HDR is all about seeing the distance between the darkest blacks and whitest whites," said Joe Cox, from What Hi-Fi? magazine. "It should make for a much more colourful and vibrant picture, which to anyone with a suitable TV is going to be that much more impressive than 4K alone." 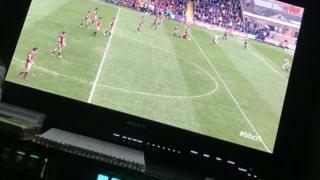 Last weekend's stream, of a rugby match involving the York City Knights and Catalans Dragons, followed a more limited test earlier in the year. In February, the BBC delivered a private livestream of 4K HDR footage from a FA Cup football club's ground to TV manufacturers. A spokesman said that the broadcaster had taken deliberate decision not to publicise the follow-up test - despite making it available to users of the iPlayer Beta app on compatible TVs - because the trial had been organised for the benefit of its engineers rather than the public at large. He declined to reveal when the next experiment was planned, or if a fully fledged service might be ready in time for the Fifa World Cup football competition, which begins on 14 June. Streaming services, including Netflix, Amazon and YouTube, already offer pre-recorded HDR TV programmes and films to UK viewers. But the BBC has teamed up with Japan's NHK to create a new flavour of the technology, which they call hybrid-log gamma (HLG). The two broadcasters say HLG is better suited to live broadcasts than other types of HDR because it does not need to provide metadata - data about other data - to work. "The equipment just doesn't support it - and we know from where metadata is used elsewhere, it gets lost, it gets corrupted," the BBC Research & Development has previously said. HLG, however, has some theoretical downsides of its own. It is not capable of describing as wide a dynamic range as Dolby Vision, nor can it provide information to calibrate the image to particular TV models. However, the BBC Research & Development says its tests indicate people cannot notice the difference. The BBC is not, however, the first to livestream sport in HDR. In March, BT claimed a "world first" when it streamed a Uefa Champions League game involving Juventus and Tottenham Hotspur in the HDR 10 format. That trial, however, was limited to a 1080p resolution image rather than 4K.